Synway successfully upgraded China Huaneng’s communications system from legacy TDM infrastructure to a complete Hybrid VOIP/TDM system. The Synway multimedia switcher SPBX was selected to perform critical functions in the new enterprise network communication and enable seamless interconnection between communication system and business needs. China Huaneng Group(http://www.chng.com.cn/eng/) is a key state-owned company established with the approval of the State Council. With registered capital of 20 billion RMB, the Company is mainly engaged in the following business: development, investment, construction, operation and management of power sources; production and sale of power and heat; development, investment, construction, production, and sale of businesses and products related to finance, energy transportation, renewable energy, and environmental protection; industrial investment, operation and management. The complete internal communication systems becomes more and more complex and vital for China Huaneng Group during the process of its business expansion and more and more branches offices came out across the world. Firstly, the group possessed over 250 branches across the globe, and most of them are located in Asian and African. How to communicate and associate with each other more efficiently and effortlessly in the group becomes the top issue. A coordinated, robust and future-oriented communications system became more and more important. Secondly, with a complex traditional communication system and independent branches, some important new communication methods were required, email, SMS, presence alert, call center and IVR in different terminal devices, including intelligent mobile, tablelet, IPAD and so on. So the new communication had to make all these features and functionality available for all of Huaneng’s employees. Early in the year 2010, Synway had partnered with its solution partner to build some unified communication systems, and it could be tailored to China Huaneng’s needs and seamlessly interconnected with China Huaneng’s platform, and it also features WEB Call, Network Callback, Network Fax, Group Call, Automatic Queuing, Load Balancing, Automatic Routing etc., and remained stable in high density calling in a distributed architecture. With the rapid development of China Huaneng’s business over the recent years, it becomes rather difficult for the previous communication system to catch up with various needs for booming businesses. Meanwhile, the leading VOIP technology was springing up and experienced deployments. China Huaneng hence introduced more applications like Mobile Internet Access, Data Infrastructure, Firewall, VoIP solutions and so on for its customers. The Synway Multimedia SPBX proved to be good for the overall VOIP/TDM system for its integration with soft switching technology, featuring versatile characteristics such as high flexibility, programmability and unlimited scalability abilities. It could be controlled and operated in a single system, although hundreds of them were distributed in different branches. Besides high compatibility with hybrid digital trunk, FXO/FXS and SIP trunk interfaces, it also possesses standard Ethernet port and dual-power design for redundancy backup, which perfectly fulfilled Huaneng’s high requirements for modern communications. Like Huaneng’s senior information manager David Hu said: “Synway’s new generation SPBX not only cut our information system cost to minimum bottom, but also make all what we really needs available more efficiently and flexibly”. Supporting up to 20 E1 interfaces, the Multimedia SPBX is highly interconnected with various devices and allows for 30,000 IP access in a single system. With years of expertise of technical support service worldwide, Synway's engineers offer Huaneng responsive and efficient development, deployment, and design support to help developers rapidly deliver sophisticated revenue-generating applications. 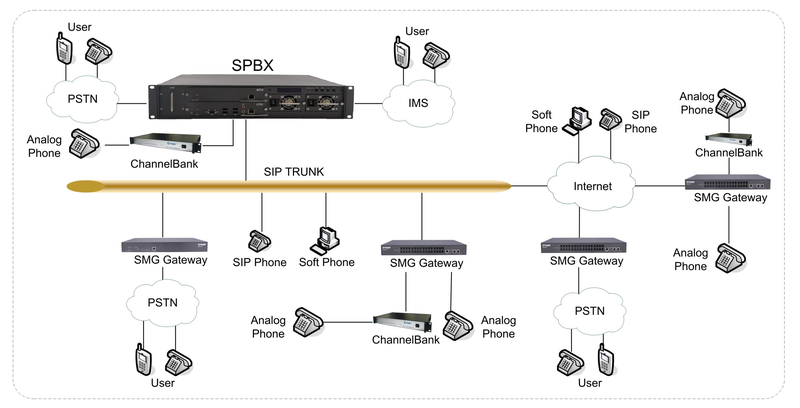 In hybrid IP and PSTN networks, a new range of applications can be realized by Synway's SPBX series, which combines IP and PSTN access technologies, such as gateway, hosted call center, IVR, prepaid card service, voice mail, faxmail, unified messaging, auto attendance, conferencing and more. Synway's IP and PSTN architecture provide customers with matchless cost advantage, powerful signaling protocols and multimedia resources in most demanding applications. Synway's IP signaling and media processing technologies cater to ultimate demands of pure IP-based applications in the ever changeable environment. Synway's underling thinking of product design is to make this ultimate IP-based demands and PSTN-based applications closely interconnected as well as completely independent. Snway's SPBX forms a .complete, flexible, high perform turkey solution for VoIP applications to who need to connect their service or applications to legacy PSTN networks. This combination brings highly scalable, flexible PSTN to IP transport and signaling functionality, standard PSTN trunks and NIC interfaces and supports for SIP, SS7 (ISUP/TCAP/TUP/MTP), SCCP(MAP), ISDN variants, CAS as well as a wide range of media processing capabilities. In addition, this evolutionary combination makes it easy add cost effective to offer SIP-based services to traditional telephony users, or connect traditional PSTN applications to IP telephony subscribers. 4. Tele-grade reliability: High cost performance and Telco dual-power redundancy and can efficiently balance the calling overload.